Jogging is an excellent exercise for burning fat and losing weight. It provides an aerobic workout, raising your heart rate for an extended time period. Jogging increases your rate of breathing so you take in more oxygen which gets delivered to your blood stream and eventually to your muscles. However, not all jogging provides the same level of challenge and delivers the same benefits. Certain types of jogging exercises maximize the fat you burn. 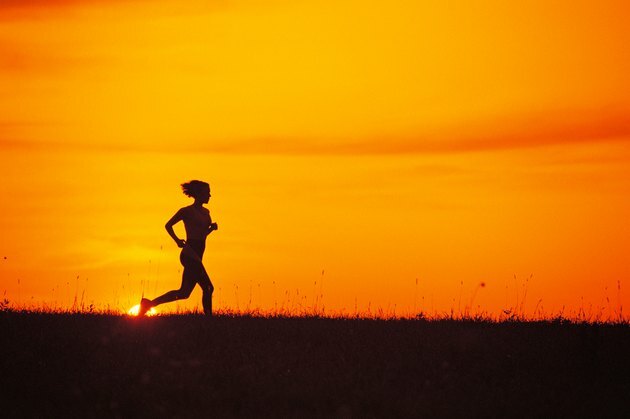 The speed of your jogging workout affects how many calories you burn. For example, a 155 pound adult who jogs a slow 12-minute mile burns 596 calories in one hour. Jogging at 10-minute mile burns 744 calories in one hour, and a 9-minute miles burns 818. Pick up your speed to a 7-minute mile run and you burn 1,078 calories. If you work out at this level daily, you lose 2 lbs. of fat per week, given that you need to burn 3,500 calories to drop one pound. One of the best ways to burn more fat without increasing your jogging speed involves making your jogging regimen more intense. If you jog on a treadmill, adjust the setting so that you jog on an uphill grade. If you run outdoors, select a hilly course or one on a gradual incline. You elevate your heart level higher when climbing hills, which makes you burn fat faster. Climbing steep hills builds muscle mass on your lower body. You burn more calories to support this denser muscle, raising your resting metabolism. Jump training, or plyometrics, is a technique for advanced joggers and runners who want to develop explosive power. It's not for everyone, so make sure you're in excellent physical health and work with a trainer. Begin your jumps from ground level. Avoid doing plyometrics on concrete or other hard surfaces. Instead, exercise on grass or on a mat over a wooden floor. The jump squat involves moving from a deep squat into a high jump, landing on both feet and squatting again. Other moves include jumping over cones and jumping onto a raised platform. Doing the same jogging workout daily makes your body too efficient. You burn less calories as you get more fit. Keep your jogging workout more challenging and maximize your fat-burning by incorporating speed sprints into your training. Do your regular warm up for up to 10 minutes. Start jogging at a brisk pace. After five minutes, sprint for 30 seconds to one minute. Slow down your pace for 30 seconds to rest and recover. Build back up to your brisk jog and prepare for another sprint in four to five minutes. Can Jogging Burn Off Love Handles?